I've been crocheting a lot lately. It really helps me work off all the frustration I've been feeling. I'd much rather work my fingers raw and end up accomplishing something I'm proud of, than let my frustrations out on my kids. When I do that, I'm not proud. Because in the long run...none of that really matters, does it? Family is forever, and I love my babies just the way they are. 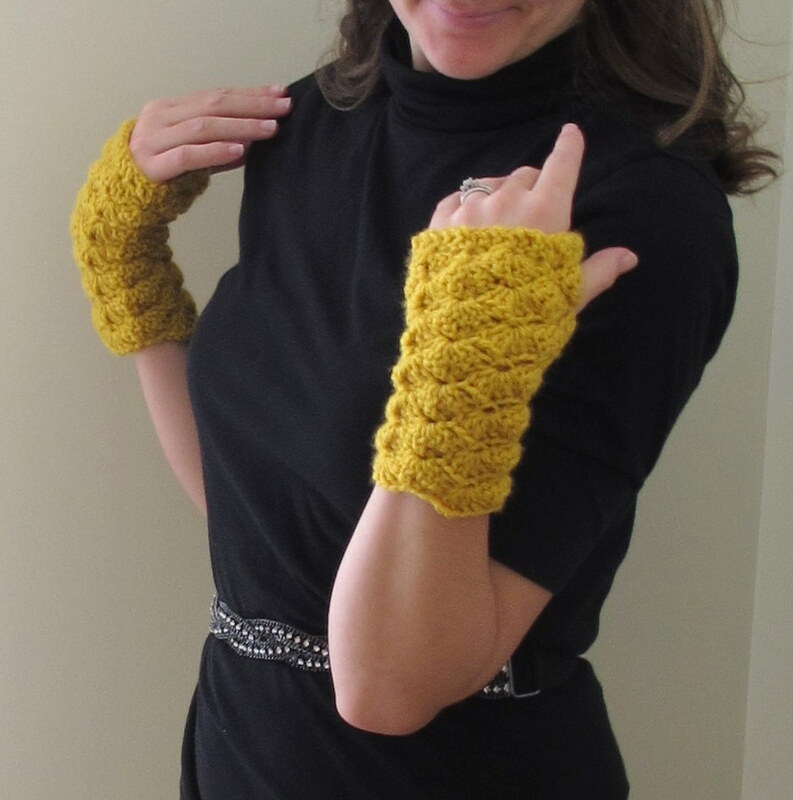 Fingerless gloves are ever so popular these days. I guess that happens when every one has a touch screen gadget of some sort, and the gloves with the little patch on the pointer finger are not cute, whatsoever. 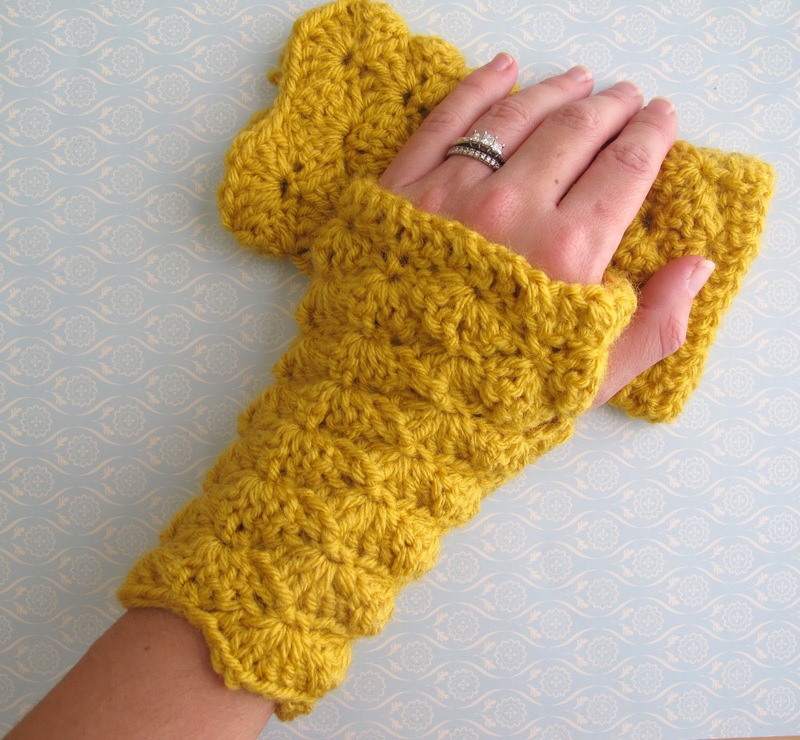 So, I worked up an easy little pattern for you if your hands are cold, but you need a little mobility without sacrificing style. Step 1. Ch 30. Sl st in first ch to form loop. Step 2. Ch 3 (counts as first dc, here and throughout). Dc in each ch around. Sl st in top loop of first ch 3. Step 3. Ch 2. Skip next 2 sts. *(3 dc, ch 1, 3 dc) in next st. Skip next 2 sts. Sc in next st.* Repeat *-* around. There should be 2 sts left after your last shell st. Sl st in top loop of first ch 2. Step 4. Sl st in next 3 sts. Sc in next ch 1 space. *Skip next 3 dc spaces. (3 dc, ch 1, 3 dc) in sc space. Skip next 3 dc spaces. Sc in ch 1 space. * Repeat *-* around to last ch 1 space. Sc in that ch 1 space. Ch 4. Skip next 6 sts and sl st in top loop of the sc placed in the first ch 1 space (This creates the hole for your thumb). Step 5. Ch 3. Turn. (2 dc, ch 1, 3 dc) in ch 4 space. Skip next 3 dc. Sc in ch 1 space. *Skip next 3 sts. (3 dc, ch 1, 3 dc) in next sc st. Skip next 3 dc. Sc in ch 1 space. * Repeat *-* around to last ch 1 space. Sc in last ch 1 space. Sl st around post of first ch 3. Step 6. Ch 3. Turn. (2 dc, ch 1, 3 dc) in same st. Skip next 3 dc. Sc in ch 1 space. *Skip next 3 sts. (3 dc, ch 1, 3 dc) in next sc st. Skip next 3 dc. Sc in ch 1 space. * Repeat *-* around to last ch 1 space. Sc in last ch 1 space. Sl st around post of first ch 3. Step 7. Repeat Step 6 for 9 more rows. You can easily add/subtract rows to the pattern depending on how long/short you like them. I think they look best with a long sleeved shirt or under a coat. They are fashionable and with the right color yarn, you can really spice up an otherwise ordinary outfit! You could even pair them with a cute bow, sparkly bow, or flower pin. ***And don't forget about my new Get Hooked! series coming up in January! Think Happy Thoughts will begin the first week of January and is a crochet series where I post a new Free pattern every week until the end of February. This time around, my patterns are focusing on all things fanciful and magical...think fairy tales, knights, and happy endings! So I kinda wanted to learn to crochet before I saw this, but now I'm determined! Those gloves are SO MUCH FUN. I'm a new follower! I hope you'll follow me back! I was just invited to participate in this contest and think you might enjoy it too http://elisabethandree.posterous.com/crochet-contest-part-2 don't forget to add your stuff to ravelry, I get quite a huge chunk of my page views from them! These are adorable and I am hoping I can put a set together for my daughter's stocking. Thanks for sharing! Oh, these came out great! Beautiful! These are perfect! Would love for you to link up @ Find Your Craft Friday over on my blog... Have a great Friday! I just bought a goodwill sweater that I'm going to do this with! TOO CUTE! You make me excited to get going! I absolutely LOVE your blog and am excited to be your newest follower!!! I'd love it if you'd return the "love" on your next visit!!! How fun! Came over from Southern Lovely! I love them, and especially with that mustard yellow they are just delightful. 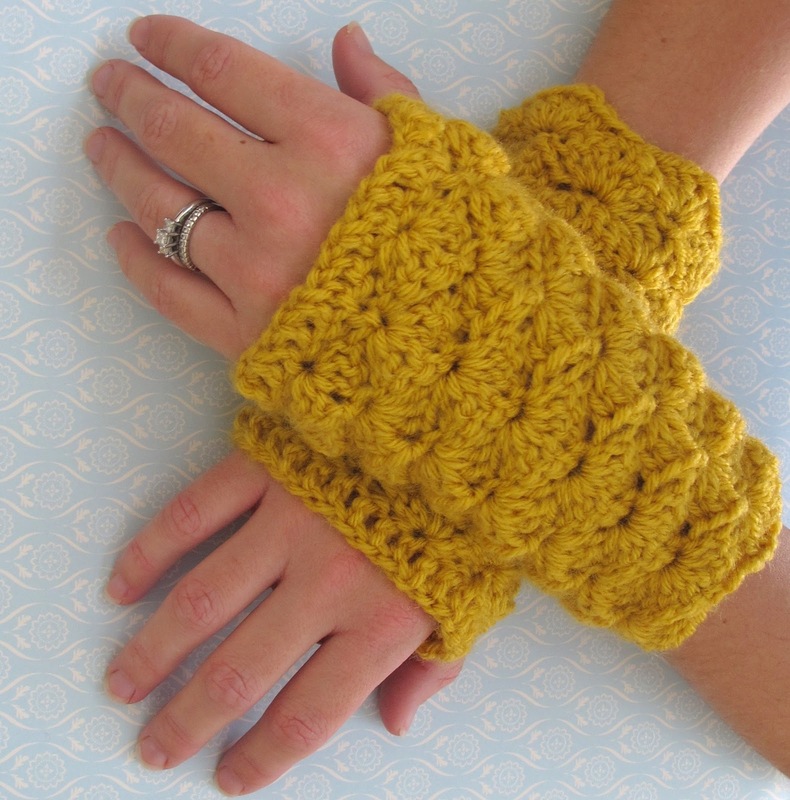 I hope to whip up a pair for my sister-in-law and then one for me. I love these mittens! I'm trying to make a pair for my sister but, somehow, they are either too big or I am adding a shell to each row when I should not be. Could you possibly edit pattern to state how many shells are in each row? I would really appreciate it. I too am finding that they are coming out large and think I'm adding extra shells somehow. I'm a pretty decent crocheter... not advanced but not novice, but I still can't seem to figure out what's going wrong. I second the request to know how many shells are on each row. Thanks!!! LOVE THEM! Here are the number of stitches/shells for each row. Working around the thumb hole in steps 4 and 5 is the tricky part. After looking at the number of shells for each step, please let me know if you still have questions! Step 2. 30 DC including the first ch 3. Step 3. 5 shell stitches. Step 4. 4 shell stitches. Step 5. 4 shell stitches. Step 6. 4 shell stitches. I just made these for my 16 year old daughter. She LOVES them. After I was done with them she wanted them a bit longer towards the fingers so I added 2 rows of sc, a row of hdc then a row of crab stitch. LOVE, love love the pattern. Thanks so very much. Melissa, it might help if you think of it a little differently. 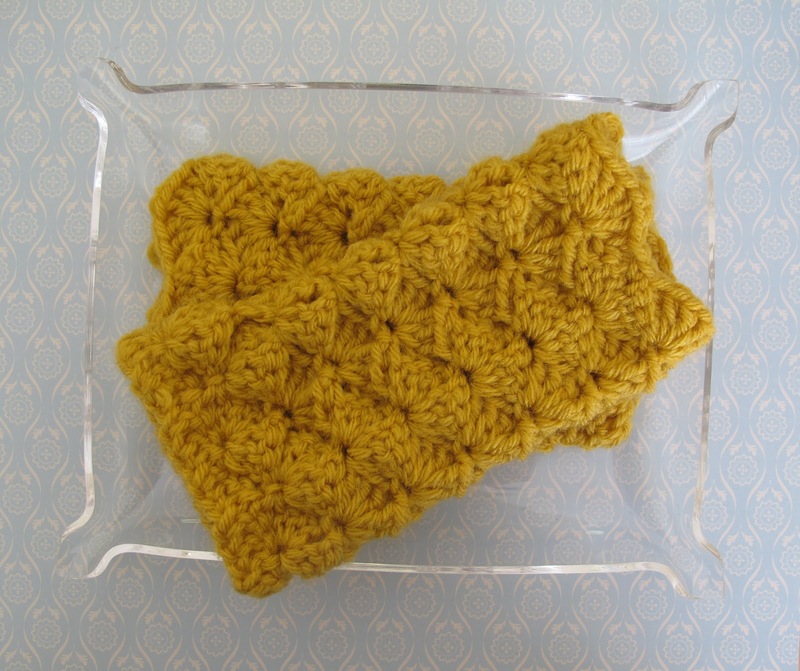 Instead of focusing on the sts that you are skipping, just remember to place 1 shell stitch in the sc space of the previous row, and 1 single crochet in the ch 1 space from the shell stitch of the previous row. The shells go together kind of like a puzzle, fitting neatly in between the shells of the previous row. There should be 4 shells in step 4. Let me know if you have any further questions. My hands are a bit larger/longer than "normal" and I feel like the thumb hole may be too small. Any suggestions on making the chain 4 longer and how that will effect the rest of the pattern? Any help would be appreciated. *question! * How would I make these in "youth" size (for small 10 year old). How many chain stitches would I start with, and how many shells around? Adri Jo, to make these for a 10 year old, I actually wouldn't change the pattern! They are a pretty universal fit and yarn typically has some stretch to it. If you need to you could always use a smaller hook or a 3 ply yarn instead of worsted. After spending two nights on this and needing to make them as quickly as possible as a gift, I have finally figured out why mine keep turning out too large with extra shells. Between the asterisks, it says to do a shell, skip 2, do a sc, then repeat. It does not say to skip two stitches again before making the next shell. This is a crucial step! I have frogged these several times, changed hooks and pulled my hair out trying to figure out why I couldn’t get this pattern to work! Please save others the same agony and correct that step, lol! Thank you!! Also, when you say, skip 3 dc **spaces** and work a shell stitch in the next sc **space**, do you mean to say **stitch** instead? Or should we be working in the space between the sc and 3 dcs as the instructions say? I think you meant to say to work it into the sc stitch and not the space around it, right? Hello, the link to this pattern seems to be broken. I would really love to make these! I would love a copy of the pattern if it is still available. Hello, the link to this pattern seems to be broken. I would like to make these for my mother. I would love to have a copy of the pattern if it is still available.